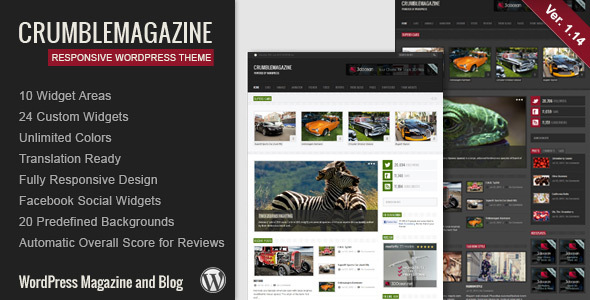 Crumble Magazine is a Responsive Wordpress Theme, best suited for Magazines, News and Blogs. It comes with 24 awesome widgets and 8 widget areas, built-in review system and 4 post formats (image, audio, video & gallerie) and tons of theme options. Crumble is developed on the Skeleton — beautifull boilerplate for responsive development so it look beautiful at any size, be it a 17” laptop screen or an iPad, iPhone. Visit the responsive preview site (dark or light version) and resize your browser to see it in action or visit Crumble Magazine directly on your mobile device. 24 Custom Widgets – Easily add categories and columns to the homepage with custom widgets. CrumbleMagazine gives you the flexibility and ease of use to display your content the way you want it without altering any code. If you like my work, please rate it. If you’re about to rate it with less than 5 stars, please let me know the reason first and I will do my best to improve the theme. Thanks so much!